The workshop is designed for people who have children and young people in their lives or work, and is focused on having conversations about sexuality with young people. 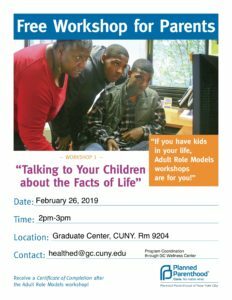 Please RSVP to healthed@gc.cuny.edu by 2/24/19 to attend. Event flyer also attached. Please reach out to healthed@gc.cuny.edu with any questions about the workshop.